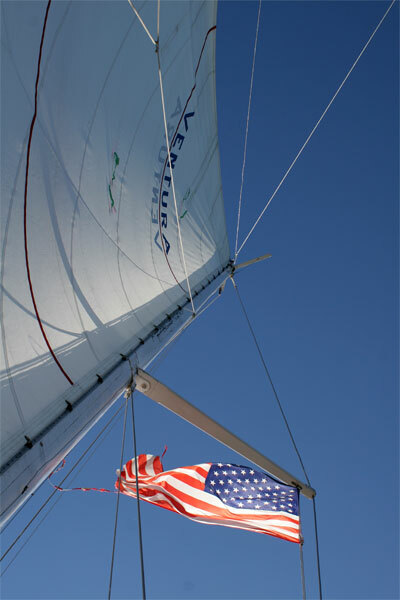 It was a perfect Sunday afternoon for sailing: an Indian Summer day and just a hint of autumn in the air. 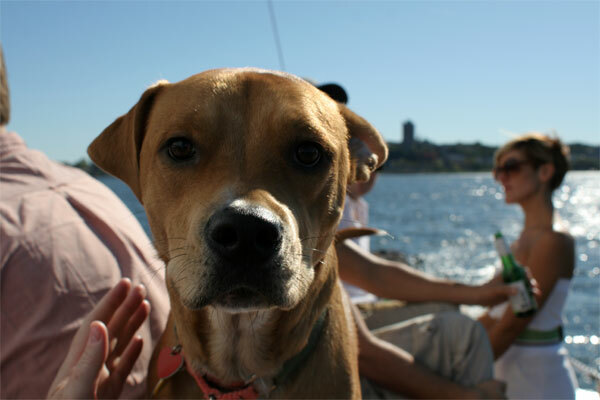 25 of us (and a dog named Bobbie) went out on The Ventura, a single-masted, wooden sailing yacht commissioned in 1919. The cruises are arranged through DBA, a pub in the East Village. I’ve been joining the DBA tours since I moved to New York in 2001, most often with my friends Kathryn and Ziggy. The trips are relaxing, the people are fun, and the views of Manhattan from the busy harbor can’t be beat. 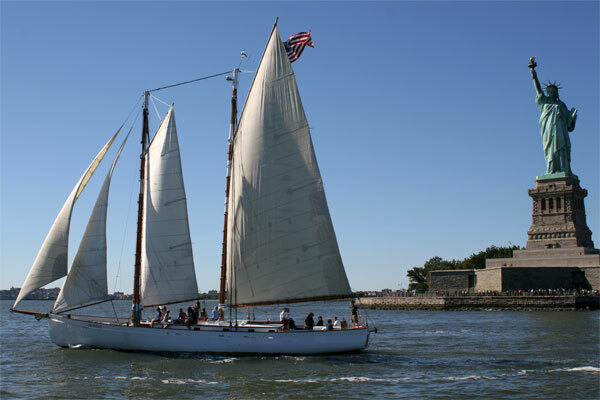 Captain Pat, at the helm of Ventura, renovated the boat himself and has been leading tours in New York Harbor for some twenty years. I’m told Pat is a descendant of southern author Joel Chandler Harris, who wrote the Uncle Remus stories, and he’s quite a storyteller himself. The journey began with a blow from a conch shell and we set out on the Hudson and into the Harbor for a three hour tour (a three hour tour). The winds were perfect, and most of the tour was taken under sail. Captain Pat shut the engines as soon as the sheets were hoisted. We glided past the Statue of Liberty and then south to Bayonne, New Jersey, where giant cruise ships dock. As we neared Staten Island, Pat turned us around and we headed back toward Manhattan, giving us a stunning view of the world’s greatest city as the wind pushed us back to the Winter Garden docks right next to the World Trade Center site. Since the tour was arranged by a pub, there were tasty libations aboard, and champagne for a passenger’s birthday toast. Quite a contrast to my last felucca (Egyptian sailing boat) ride on the Nile, with some of my best Cairo pals. We poured rum from a plastic bottle and pretended it was iced tea so we didn’t offend the captain, who performed his prayers from the rudder during the middle of our trip. Captain Pat told stories and talked like a pirate. And, after a year of drinking mostly third world lagers, the beer was cold and yummy. You make New York sound like a lot of fun. Maybe I should stop thinking of it as jail that I am sentenced to starting next week! No more iced tea for you, bucko!